There are over 350 genetically distinct breeds of domestic dog that present considerable variation in morphology, physiology, and disease susceptibility. The genome sequence of the domestic dog was assembled and released in 2005, providing an estimated 20,000 protein-coding genes that are a great asset to the scientific community that uses the dog system as a genetic biomedical model and for comparative and evolutionary studies. 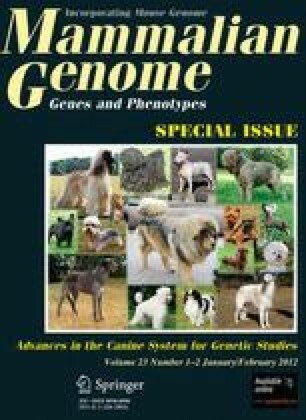 Although the canine gene set had been predicted using a combination of ab initio methods, homology studies, motif analysis, and similarity-based programs, it still requires a deep annotation of noncoding genes, alternative splicing, pseudogenes, regulatory regions, and gain and loss events. Such analyses could benefit from new sequencing technologies (RNA-Seq) to better exploit the advantages of the canine genetic system in tracking disease genes. Here, we review the catalog of canine protein-coding genes and the search for missing genes, and we propose rationales for an accurate identification of noncoding genes though next-generation sequencing. We acknowledge the Centre National de la Recherche Scientifique, the University of Rennes 1 for funding. TD was supported by the Conseil Régional de Bretagne and AV was supported by the European Commission (FP7-LUPA, GA-201370). We thank Jocelyn Plassais for the dog photographs.